What is this? Elim Church and our ministry to those experiencing homelessness (Hope Avenue) has partnered with Envision Community to see affordable, low barrier housing come to people experiencing homelessness in our city. 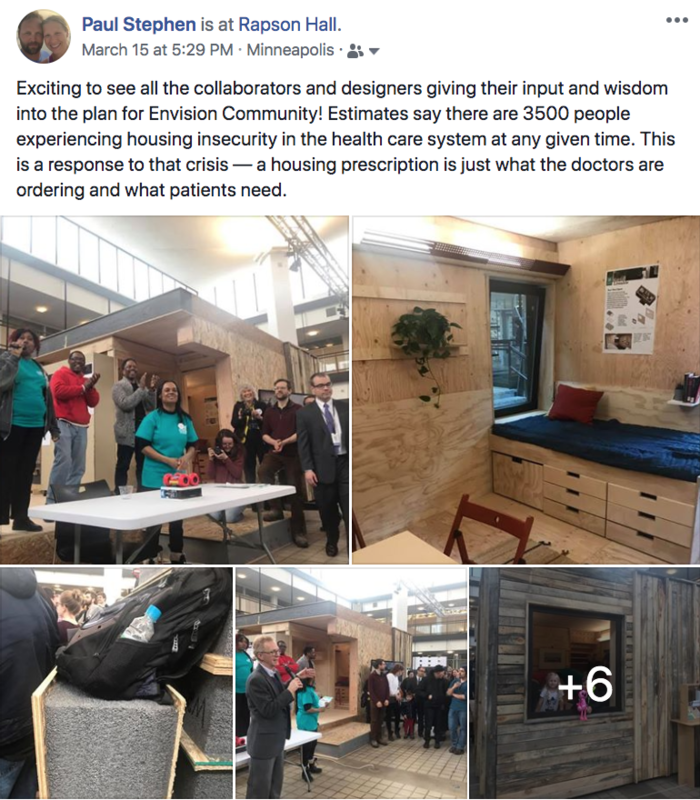 With Envision Community, tiny homes, human-centered healthcare design and intentional community combine to achieve health equity for those suffering from chronic illness and pervasive homelessness. Update 4/10/19 Move to Elim is postponed due to weather. The new date will be 4/27! Update 3/30 – The Envision Community team with help from Architecture students and professors and volunteers is (weather permitting) bringing the demonstration unit from the University of Minnesota Rapson Hall to Elim for assembly and finishing over the weekend. The demonstration unit will be located in the parking lot a few yards from the northwest corner of Elim’s building. The unit will have a sign posting information about the unit for visitors and sidewalk go-ers explaining why its at Elim and the overarching vision for Envision Community. We are thankful for the support of the City of Minneapolis, Hennepin Health, Street Voices For Change, MICAH. If you are interested in helping with the assembly email me. Update 3/14 – During a UofM Design Center project week (Catalyst), 1st and second year Architecture students worked along side the Street Voices for Change advocates to make some important updates and modifications to the plan. We were all struck by the quality and craftsmanship of the build — high end design work, large functioning windows as well as its super thick walls which provide incredible insulation value! Both practical and beautiful the group collaborated to add some clever storage and organization to the unit as well as a place for a private bath. The unit will be disassembled be brought to the Elim Church parking lot for storage until the demo unit home can be reassembled and properly sealed. We also received good news, with help from MICAH, Envision has received approval from the Mayor of Minneapolis to begin writing the city code variances for these units. Great excitement was shared by all who were in attendance and we all felt this was a watershed moment for this project. Well done Bill, UofM students and professors, Junail, Rome, Duane, and others from Hope Avenue and Street Voices! Update 3/1 -ELIM, did you know that Homelessness is considered the number one barrier to achieving health equity in our communities? Elim has a great opportunity to partner with Envision Community to see affordable housing happen in our city. – help build a demonstration unit (U of M Design Center) – volunteer to help get the word out. 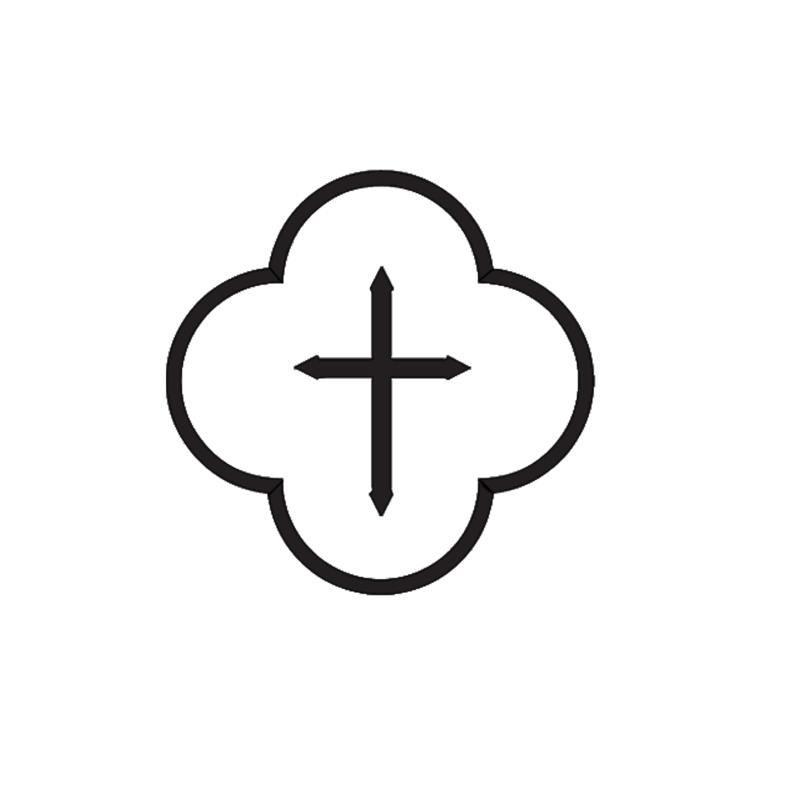 – host the first discussion model. (See Pod A below) – hear from experts. (including our own Junail Anderson!) – help collect feedback from the community. 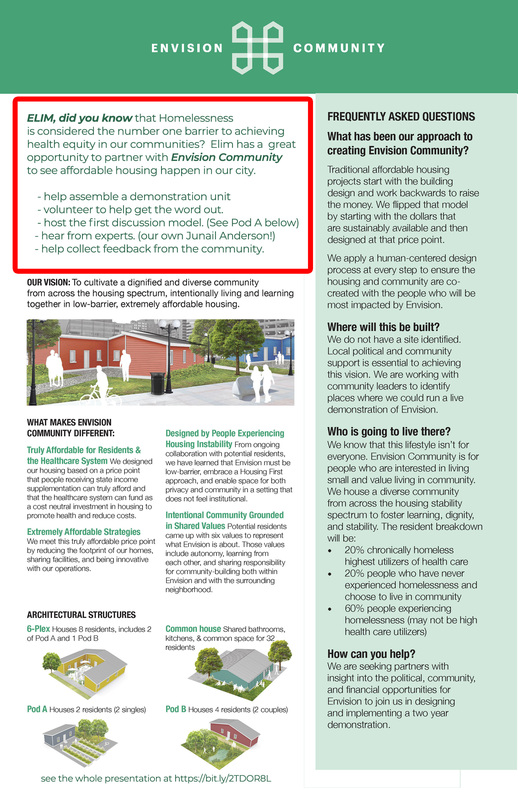 Invitation from Envision: We would love to have you check out our mock-up of an Envision Community unit! As you know, our Street Voices team has worked with architects from Alchemy and the Minnesota Design Center to design micro-homes for Envision Community. This public showing is part of the Catalyst Workshop offered by the University of Minnesota School of Architecture. Architecture students will collaborate with our Street Voices team for one week to create important details for the unit like the utilities, wall finishes, and furniture. Their work will be displayed as part of a public showing within a full-size mock-up of the Envision Community unit. This is the first time our community can see what an Envision Community unit will look like at full scale! We are so thankful for the Pohlad Family Foundation who generously supported the construction of this unit. Once we complete this mock-up, we will then move forward with building a single unit for our community to review and we look forward to showing you this completed home later in the year! So please join us for the public showing of the full-scale mock-up of our unit and celebrate the great work by the architecture students and our Street Voices team during Catalyst week!